In the last decade, Croatia has quickly grown into a massively popular travel destination, with nearly 12 million visitors traveling to this country on the Adriatic Sea last year. 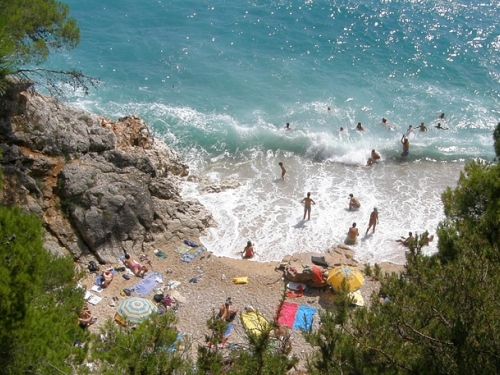 But let’s face it, if there’s one thing people think of when they think about travel to Croatia, it’s the beaches. With about 1,1000 miles of coastline along the scenic Adriatic Sea, and over 1,000 island off its coastline, the country is literally overflowing with beautiful beaches, hidden bays, untouched coves, and enough party beach spots to keep even the most active traveler occupied for as long as they can handle it. To help give you some ideas about beaches in Croatia to visit, here’s a list, in no particular order, of the top 10 beaches in Croatia. Lubenice is an ancient fort city on the island of Cres, and the beaches there are a great place to visit if you are looking for seclusion and some quiet time enjoying the dramatic scenery aboard a sailboat. The beach can be reached by a long walk down the rugged path from town or by boat. 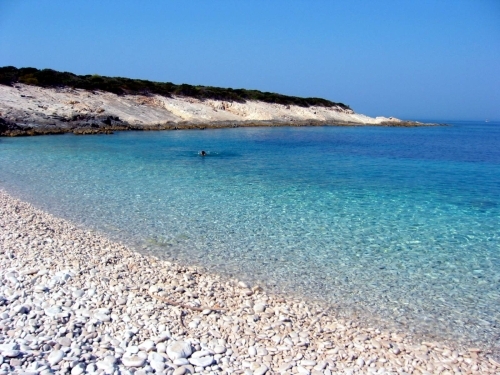 The tranquility of this white pebble beach is ideal for swimming and relaxing in the crystal clear waters. 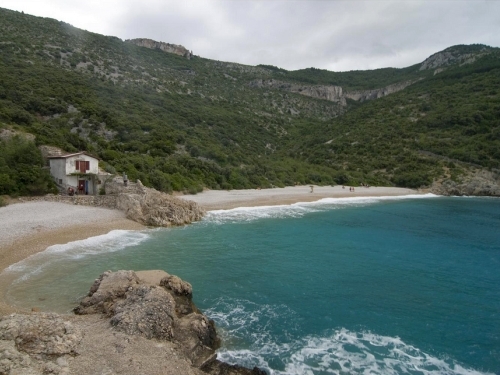 Rajska Plaza (Paradise Beach) is the most popular beach of the 20 or so beaches in Lopar, the northernmost village on the island of Rab. The sandy beach stretches a little over a mile along Crnika Bay, and the waters are so shallow that you can almost walk to the small island that sits in the middle of the bay. The beach itself has many amenities, including nearby restaurants and cafes, and there are basketball and tennis courts there in case you get bored lying around all day. If you’re looking to party, Zrce is your beach. The long beach near the town of Novalja on the island of Pag is the best place to party in Croatia during the summer months. 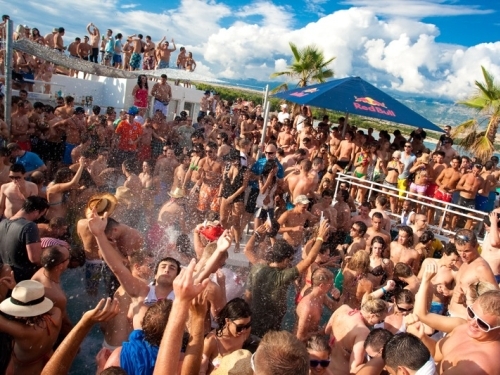 Many famous DJs perform at the local open-air clubs including Aquarius, Papaya and Kalypso. During your downtime you can rent deck chairs and beach umbrellas and hang out at the scenic beach. Or, if you have the energy, you can dance, drink and mingle throughout the day and well into the night. Saharun Beach is a white sand beach located in the northern part of Dugi Otok, the largest island in the Zadar archipelago. Facing the open Adriatic Sea, Saharun offers a view of an endless horizon and turquoise blue waters. Despite its beauty, the beach is relatively quiet throughout the year given the island’s relative isolation. Surrounded by pines tree, visitors can enjoy the shade or snorkel around the shallow waters. 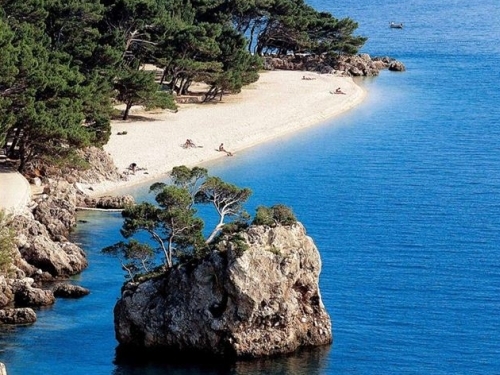 Punta Rata Beach is situated in the central Dalmatia town of Brela and is one of the most stunning beaches in all of Europe, let alone Croatia. 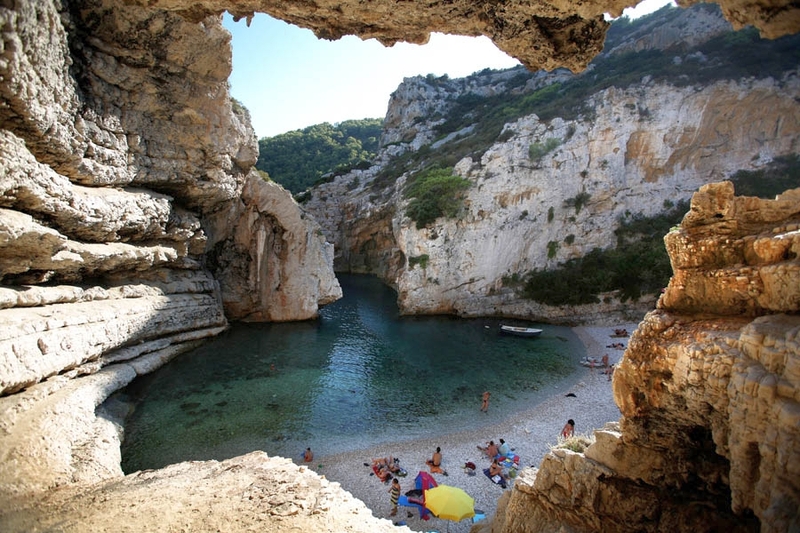 In fact, the beach is consistently ranked among the best beaches in Europe. 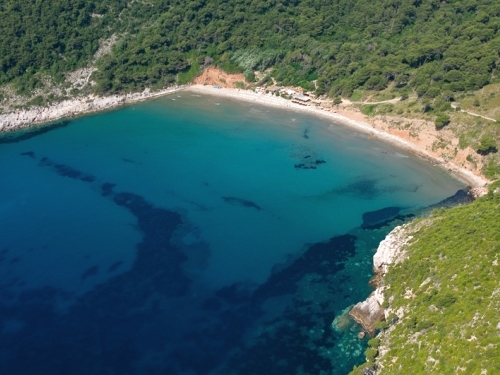 The coves in Brela stretch for many miles and offer a private, secluded atmosphere among the pine trees. The image of Brela Stone, a small rock island just off the beach, is known throughout the country. Nearby, luxury hotels cater to the many visitors that flock here throughout the year, which makes sense since it’s one of the most popular tourist destinations in Croatia. 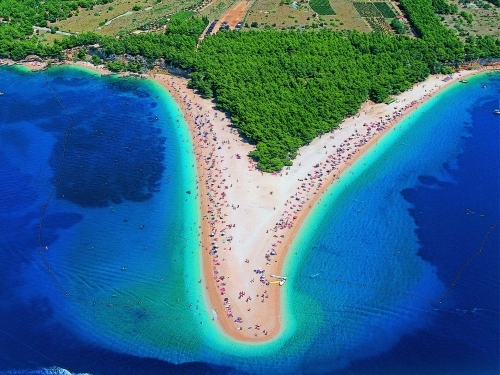 Zlatni Rat (Golden Cape), is probably one of the most famous beaches in Croatia. The white pebble beach stretches into the open sea and changes its shape according to the direction of the wind and the waves. This is the ideal place for surfing, diving and other water sports. A promenade lined with pine trees connects Zlatni Rat with the town of Bol. The stunning beach setting is great for enjoying nightlife in numerous restaurants and outdoor bars, and for the adventurous types, parts of the beach are clothing-optional. Jagodna is an isolated cove located at the foot of Hvar’s highest point, St. Nikola Hill, in the southern part of the island of Hvar. The best way to visit this secluded bay is by renting a boat and heading there by water. This peaceful place, far from the crowds, is ideal for taking a refreshing swim, sunbathing and diving. The pristine Bili Boci Beach is located on the small island of Proizd, at the far western end of the larger island of Korcula, just off the Dalmatian Coast. 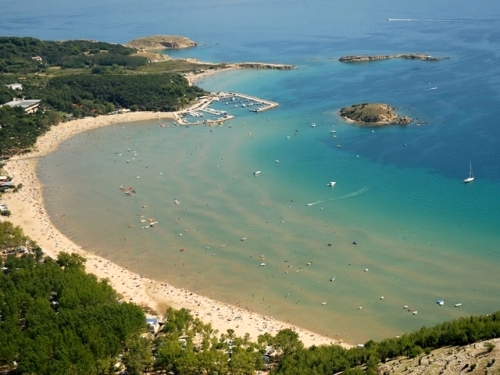 You can reach the beach by boat from the nearby Vela Luka Bay. If you are looking for nature, the beach is a great destination. Take a stroll through the forest trails to the Bili Boci Beach and enjoy the view of white rocks, crystal clear and the island of Hvar in the distance. Sunj Beach is a picturesque crescent-shaped beach situated on the sandy island of Lopud, one of the Elaphiti islands in the vicinity of Dubrovnik. 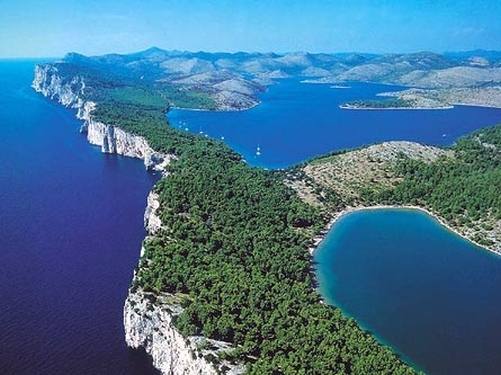 Lopud itself is a car-free island, and you can reach it by a 40-minute ferry ride from Dubrovnik. As are other beaches on this list, this one offers a clothing-optional area for those interested in evening out their tan lines. Other activities include exploring the undeveloped land nearby, and enjoying the relative quiet compared to other beaches in the country.